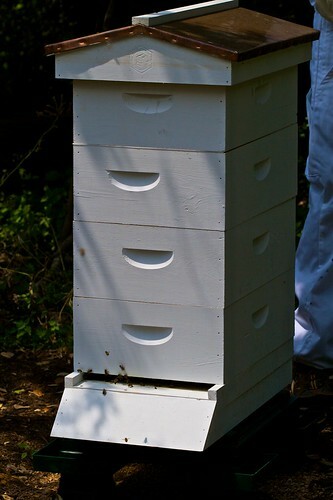 A nuc or nucleus hive is a smaller version of a normal 10-frame or 8-frame hive that can be used to catch swarms or make splits of an existing hive. Brushy Mountain had a sale on a 5 frame complete Nuc back in April, and I decided it might come in handy some day. 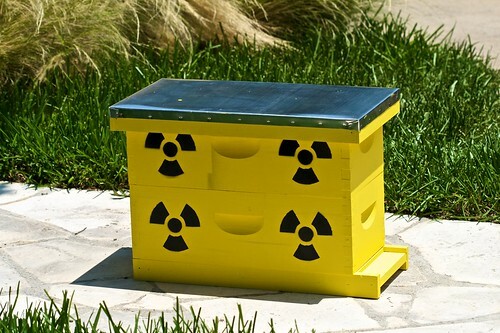 I decided to have a bit of fun with this hive so I painted it yellow with radioactive symbols on the side as a play on the word nucleus. I give to the world the Nuclear Hive (please make sure you pronounce it correctly). I think summer has finally arrived in full force in Austin making inspections a very hot affair. 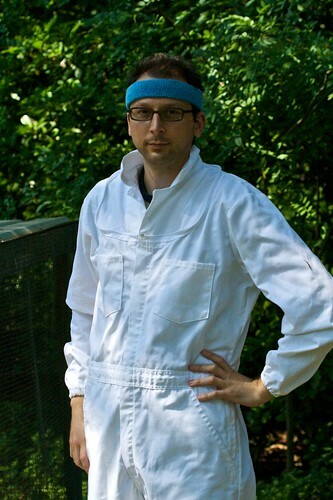 I think most beekeepers will be sporting styling baby blue sweat bands this season. The girls had gone to town on the 3rd super and most of the frames were drawn out with wax. Large Marge was also spotted in the 3rd super. I didn’t see any eggs, but there were plenty of larvae in various stages of development. The 2nd super contained the beetle blaster, and I was happy to see several dead beetles floating in the mineral oil. 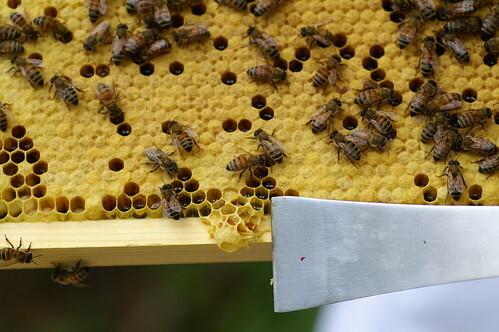 The frames in the 2nd super had a bunch of honey as well as capped brood. I think a bunch of bees just emerged from this frame as there was one right in the middle making its way out of its cell. Unfortunately, the crop was too blurry to post, but I’m hopeful to one day get a shot of a new bee emerging. 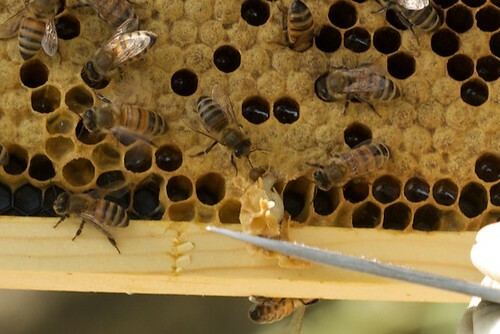 It looked like there may have been a queen cell on the bottom of the frame where my hive tool is pointing. However, it didn’t look like the textbook examples of what a queen cell is supposed to look like. There was definitely some kind of bee inside the cell when I scraped it away. Here’s a closer view, and I would appreciate a second opinion. Since the 3rd super was getting full, I added a 4th super to the hive. I put the queen excluder between the 3rd and 4th supers to make the top super purely a honey super. I also removed the entrance reducer because I felt the girls were getting a little cramped with only half the entrance available. Large Marge and her hive have come a long way since April, and I’m excited to see what the next few months bring. Here is a link to a news story yesterday about an apartment complex in East Travis County having a bee infestation. If this has been a problem since last year, as some residents are complaining, the hive must be pretty big by now in the walls. I really hope the apartment management hires a beekeeper to come remove the bees instead of bringing out a pest control company to kill them all. There was a horrible accident in Minnesota involving a tractor trailer hauling 700+ hives of bees. It was all over the news, but this link seemed to have the most information, the best video, and lack of annoying pop-up ads. 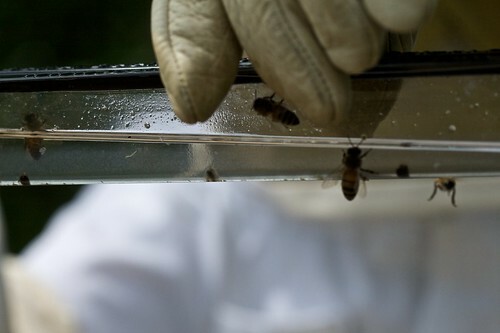 On a hot and muggy Sunday, I opened up the hive for my week 7 inspection. Time has flown by quickly, and I’m amazed how quickly Large Marge and crew have built up the hive. The 3rd super I added last week had a lot more comb on it than I expected which is great. I was a bit worried that I might have to put the feeder back on since sometimes bees are reluctant to draw out comb on new plastic foundation, but the frames are progressing nicely. This tells me there is still good nectar flow around Austin. The 2nd super is where I placed the Beetle Blaster. You can see me below inspecting the trap and noticing the lack of blasted beetles. Either the jingle has lied to me, or I don’t have enough beetles in the hive that need blasting. I did notice a few running around which were promptly squished, but hopefully the girls are keeping them under control. 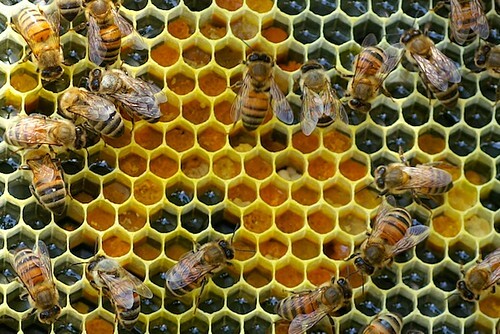 Bees store both pollen and honey in cells. Below is a good shot of cells filled with pollen surrounded by uncapped honey. Technically, it is not even honey yet but nectar that hasn’t been cured meaning the water content is still too high to be considered honey. I also thought I found a swarm cell, but I believe it is just some burr comb which refers to bits of random wax combs built basically where you don’t want it to be built. I scraped it off my handy dandy hive tool. 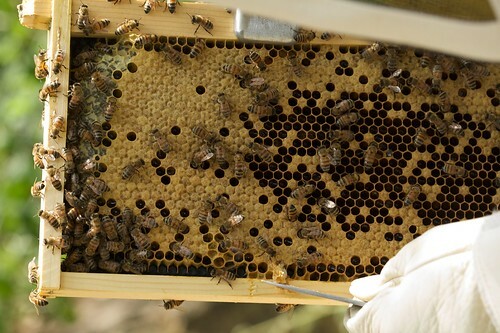 This is also a great photo showing a frame of capped brood which are baby bees in their final stage of becoming a worker. 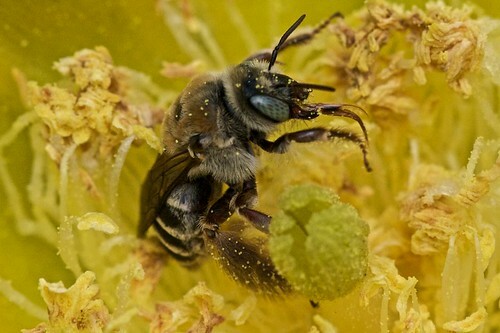 The Prickly Pears are flowering now and one type of native bee (seen below) is having a field day with these blooms. Not only are the flowers rather large, but they are chock full of pollen. These bees literally roll around in the stuff until they are completely covered in yellow pollen. I just received my Canon Macro 100mm lens this week, and I’m already putting it to good use. One of my neighbors has a large patch of Horse Mint in her front yard, and the bees love it. 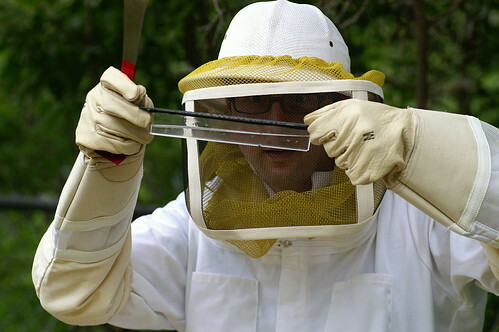 Enjoy the slide show, and I hope to get some good shots of my hive this weekend.